My big mouth got me in trouble because I told Deb that I would post a review of the book by Destiny here on my blog without checking with Destiny first. I volunteered Destiny; she didn't volunteer to do it. Finally, Destiny told me the problem of why I couldn't have a review. She had her own blog and had already posted a review months before the skype session. Since she had published the review already, she didn't think it right to post it here, too. I was glad to hear that she wasn't ignoring my request. She just didn't know how to explain why to me. Luckily, I had an easy solution to this problem. I explained to Destiny that I would just put a link in this blog back to her review that she posted. I want to say that I am continued to be blown away with the writing abilities of my students. Destiny has an honesty and eloquence in her writing, and I admire her way of turning a phrase. The insight that she gives as she described her take on the story was exceptional. I wish the book reviews that I write for SLJ and LMC were as good. I definitely think that I could learn a few things from my students. Though I don't agree with Destiny's take on Deb's books--I am a fan who has liked every book of hers that I have read, she really did like this one, a lot! 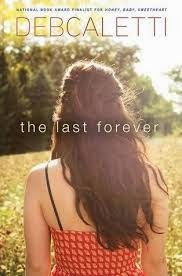 Click here to read what Destiny had to say about The Last Forever.